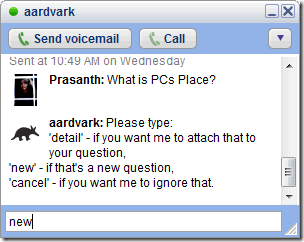 Aardvark is a free web service which lets you find answers to all your questions easily. Instead of googling for each and everything, Aardvark will get the solutions for people who know the answer. It is the first Social Search Engine which searches for people instead of web pages. You can use it via email, Instant Messenger, Twitter, iPhone and also the Web version. You can add Aardvark as a friend on your IM list (Google Talk or AIM) and whenever you need anything you can just open the window and type your question and Aardvark will ask you details and asks your friends, and friends of friends to find the right person to answer your question. You need to create an account to find your answers. It is very easy process and Facebook Connect can also be used to login.